In the main menu, navigate System>User Management>Roles. Click the Create Role button in the upper-right corner of the page. The Create Role page opens. Click General, and in the Role field, type the role name. Note that the name must be unique for the system. Description—Type the description of this role. Use the in-built text editor to format the provided description. Click Entities. In this section define which ‘action on entity’ permissions and which capabilities you want to include in the role. For more information about the ‘action on entity’ permissions and capabilities, see the Roles Management guide. For each action on each entity specify the required access level. By default, for all entities access levels are set to None. Choose an entity which you want to assign different permissions for. 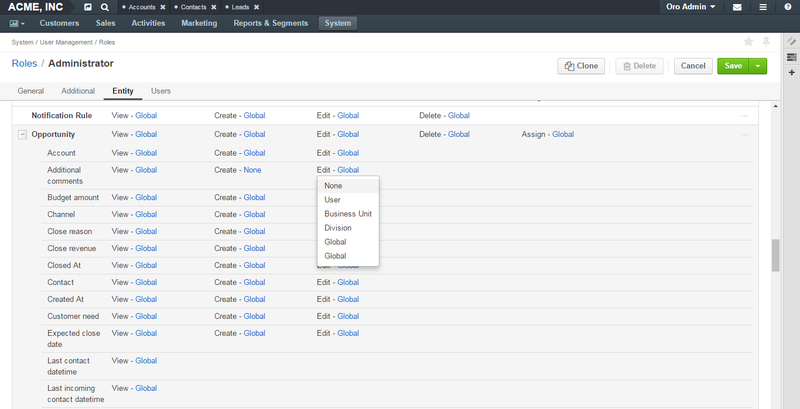 In the entity row, click the action name and in the drop-down list, click the required access level. For more information about the access levels, see the Access Levels guide. If you want to set the same access level for all actions on entity, you can complete it in one move: from the ellipsis menu at the right-hand end of the entity row, select the required access level. Under the list of entities, select the check boxes in front of the required capabilities. Click Users, and in the grid, select check boxes in front if the users to whom you want to assign this role. lick the Save button in the upper-right corner. In the grid on the All Roles page, choose the required role, click the ellipsis menu at the right-hand end of the corresponding row and then click the Clone icon. The Create Role page opens. It has all of the settings as the original role and ‘Copy of <original_role_name>’ as its name. If required, modify settings as described in steps 3–6 of the Create a Role section. Alternatively, you can clone a role from the role view page by clicking the Clone button in the upper-right corner of the page. In the grid on the All Roles page, click the required role. On the role view page, click the Edit button in the upper-right corner. Make the required changes according to the description provided steps 3–6 of the Create a Role section. In the grid on the All Roles page, choose the required role, click the ellipsis menu at the right-hand end of the corresponding row and then click the Delete icon. Alternatively, you can delete a role from the role view page by clicking the Delete button in the upper-right corner of the page. If there is at least one user that has this role, the role cannot be deleted. For more information about the field level ACLs, see the Roles on the Interface guide. Find the required entity in the list. If assigning permissions for an entity field was enabled for the entity, you will see the plus sign near its name. Click the plus sign. Besides the row with an entity name, you will see the list of fields included to this entity. Assign required permissions for actions on the entity fields. For how to assign a role to a user, review and modify the range of roles assigned to the user, see the User Access Settings guide.